The loveliest picture ever...the prince and the princess famed engagement photo. But this is not just a photo, some people made millions out of this, of out Kate's Blouse. OK, call it running with the flow, but I too love this Kate Middleton’s engagement blouse. See that blouse being hugged by this darling Prince? 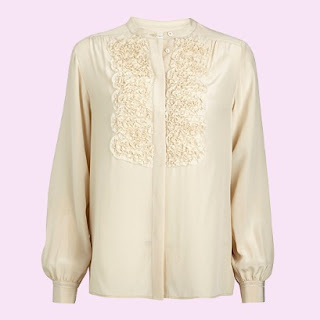 Yeah, this cream 100% silk blouse was said to be out stock at Whistles in UK due to high demand. This Kate blouse is priced 125British Pound and that’s roughly around P8,700 in Philippine currency! Holy Mackerel! I’d wait for the China version to come out! nyahahahaha...long sleeves...maglibog man sad asa ni suoton if ihatag sa akoa kay di jud baya ko mosuot ug long sleeves if naa lang ko diri sa Pinas...if naa Sweden, okay rah hahahaha. bagay na sa imo Vernz kay gatudlo man ka, tsaka attend pod mga conference, etc.